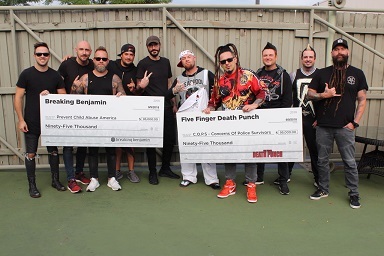 Five Finger Death Punch and Breaking Benjamin wrapped their joint headlining summer tour last weekend, and the tour has helped two charities. The bands donated $190,000 total to Concerns Of Police Survivors and Prevent Child Abuse America. That gives each organization $95,000. C.O.P.S. works with people affected by police officers’ line of duty deaths while Prevent Child Abuse America helps develop programs that help prevent all types of child abuse and neglect. Five Finger Death Punch guitarist Zoltan Bathory was humble as he talked about donating to C.O.P.S. C.O.P.S. Executive Director Dianne Bernhard was appreciative of the donation. Breaking Benjamin front man Benjamin Burnley was just as humble as Bathory as he talked about working with Prevent Child Abuse America. PCAAA President and CEO Dan Duffy was moved by the donation to his organization. Breaking Benjamin and Five Finger Death Punch will head back out on the road together this fall thanks to fan demand for more from the bands. The groups’ new tour is currently scheduled to launch Nov. 6 in Whichita, KS and to run through Dec. 11 in Portland, ME. The tour, whose dates are noted below, also features performances in Fayetteville, NC; Bozeman, MT and Lincoln, NE. Each band will tour in support of its own new full-length studio recording — Five Finger Death Punch in support of And Justice for None and Breaking Benjamin in support of Ember. Five Finger Death Punch and Breaking Benjamin have partnered for an extensive new co-headlining summer tour. The 32-date tour launched July 16 in Seattle, Washington and runs through September 9 in Cleveland, Ohio. It includes scheduled performances in Austin, Texas; Camden, New Jersey; Cincinnati, Ohio and many other cities. The tour’s current schedule is noted below. Nothing More and Bad Wolves are scheduled to serve as support for the tour. Tickets and VIP packages are available via 5FDP and Breaking Benjamin‘s official websites. $0.50 of each ticket sold to the tour will go to benefit Concerns of Police Survivors (C.O.P.S. for short) and to Prevent Child Abuse America. C.O.P.S. works with survivors and co-workers of officers killed in the line of duty. It does this through partnerships with law enforcement and the community. PCAA provides services that improve child well-being and develops programs that prevent child abuse and neglect of all kinds. 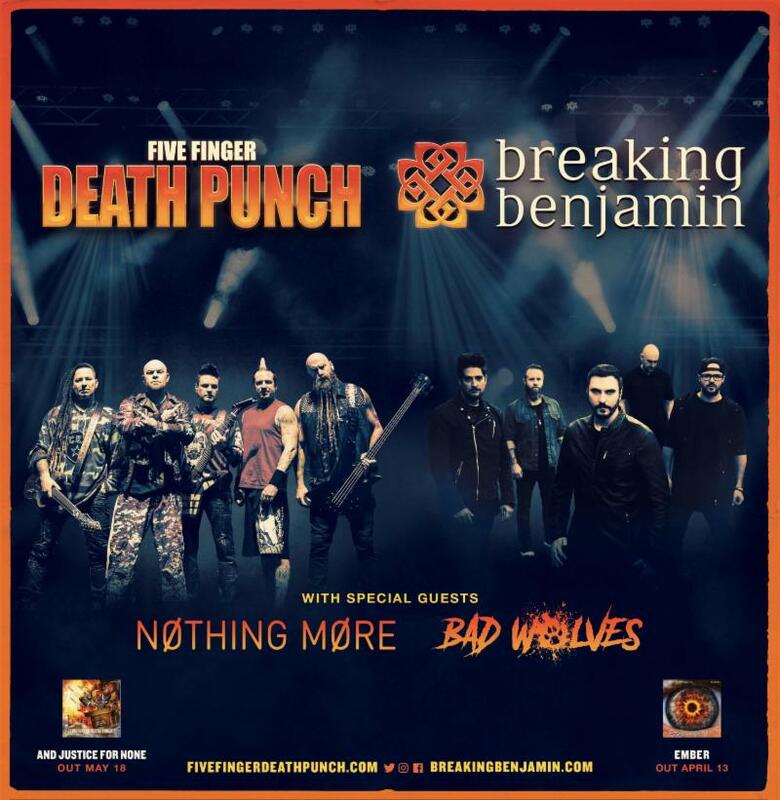 The upcoming tour is key for both bands, as Five Finger Death Punch just recently released its latest album And Justice For None while Breaking Benjamin’s latest album, Ember was released just this past April. 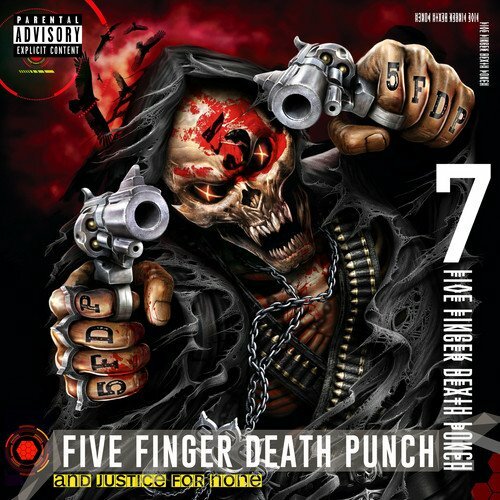 And Justice For None, 5FDP’s seventh full-length studio recording, debuted at #4 on Billboard’s Top 200 Chart and has sold more than 100,000 copies while also generating 100 million U.S. on-demand streams and more than 250,000 digital song sales. 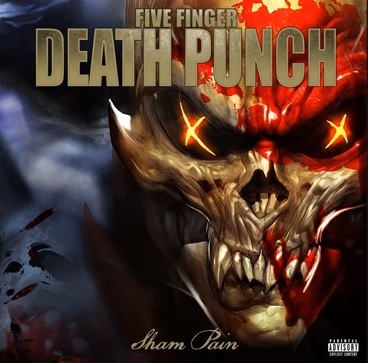 It is also the fifth consecutive top 5 album release for 5FDP. Adding to its marks, it has four other #1 placements on other charts, including: Top Digital Albums, Top Rock Albums and Top Hard Rock Albums of 2018. Its lead single, ‘Sham Pain,’ currently sits at #7 at Active Rock. Breaking Benjamin’s latest album Ember debuted at #3 on Billboard’s top 200 Chart. In the months since its release, it has gone on to sell more than 200,000 copies, has charted in Top 10 lists worldwide, topped #1 charts across various genres, including: Top Alternative Albums, top Rock Albums, Top hard Rock Albums, and Top Digital Albums, and is the band’s fourth top 5 debut on Billboard’s top 200 Chart, following 2015’s Dark Before Dawn, which debuted at #1, 2009’s Dear Agony (#4) and 2006’s Phobia (#2). Bad Wolves’ new album Disobey was released this past may via Eleven Seven Music. It debuted at #22 on Billboard’s Top 200 Albums Chart and reached the #4 spot on Billboard’s Hard Rock and Rock charts. It hit #8 on the Top Current Albums Chart. The band’s cover of the Cranberries’ hit song ‘Zombies‘ — and tribute to the late Cranberries singer Delores O’Riordan — has been certified Gold in the U.S. and has received more than 125 million views across various platforms. The song also has topped a number of charts, including iTunes’ overall and Rock charts, Billboard’s Mainstream Rock Songs chart, Spotify’s Global Viral 50 Chart and Active Radio Charts. Nothing More will be touring on the back of its most recent album, 2017’s The Stories We Tell Ourselves, which debuted in the top 20 of Billboard’s top 200 Chart, and earned the band three Grammy Award nominations — Best Rock Album, Best Rock Performance and Best Rock Song for the album’s #1 hit single ‘Go to War.’ The album’s latest single, ‘Just Say When‘ debuted this past April. 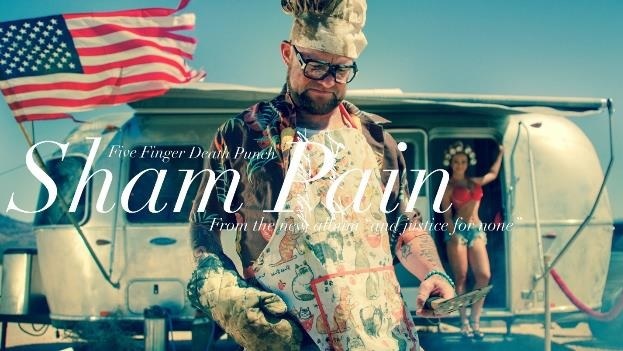 The wait is finally over for Five Finger Death Punch’s ‘Sham Pain’ video! Only days from the scheduled release of the band’s new album And Justice For None, the band has debuted the video for the single, whose audio portion was just recently debuted. The video is streaming now via Vevo. While probably not fully intended to come across as such, the video also comes across as a farce of so many Limp Bizkit videos, which is sure to entertain audiences even more. ‘Sham Pain’ peaked at #2 on iTunes Metal Chart following its debut April 20. It debuted inside the Top 10 on the U.S. Rock Songs Chart, and has received more than 2 million streams over the course of its first two weeks charting. At last report, it was at #35 on the Active Rock Airplay Chart, only a week from the official release of And Justice For None. ‘Gone Away,’ the band’s cover of the hit Offspring song, which was included in the band’s hits collection A Decade of Destruction, remains at #5 on Active Rock radio. it has received over 30 million streams and has sold over 100,000 downloads since its premiere. In anticipation of next week’s release of And Justice For None, Five Finger Death Punch has launched a tour in support of the album. The tour launched May 10 in Tulsa, Olkahoma and currently runs through September 9 in Cleveland, Ohio, Nothing More and Bad Wolves are sharing time as support for the tour, which is co-produced by Live Nation and Frank Productions. The band’s current tour schedule is noted below. Tickets and VIP packages can be purchased here. Five Finger Death Punch has released more new music from its forthcoming album And Justice For None. The band unveiled the lyric video for its latest single ‘When The Seasons Change‘ on Thursday. 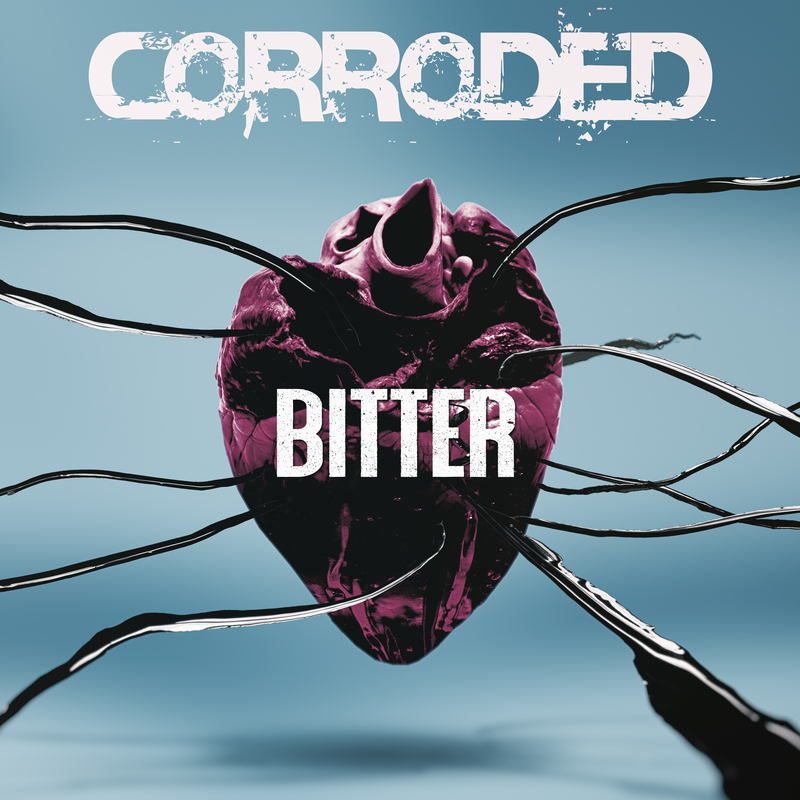 The song is a dramatic departure from the band’s most recent single, the full-throttle ‘Sham Pain.’ Whereas that song could be likened to compositions from Shinedown and other similar acts, this latest single is just as easily comparable to works from Breaking Benjamin and other similar acts. Fittingly, Five Finger Death Punch is scheduled to tour alongside Breaking Benjamin starting tomorrow, May 5 at North Carolina’s annual Carolina Rebellion Festival in Charlotte. The bands’ tour currently runs through September 9 in Cleveland, Ohio. Bad Wolves will join the bands for a handful of dates this summer, too. The bands’ current tour schedule is noted below. Tickets and VIP packs an be purchased online here. Five Finger Death Punch is giving audiences a preview of its latest album. The band debuted this week its new single ‘Sham Pain.’ The song is the second from the band’s new album And Justice For None, its seventh full-length studio recording. The album’s lead single ‘Fake‘ debuted last week and has since generated just under 1 million streams. Guitarist Zoltan Bathory explained the song is — lyrically speaking — a snapshot of everything that the band has been through in the past year. That video in question will debut soon. The band has provided a picture from the video’s shoot. It is noted below. ‘Gone Away’ (which is a cover of Offspring’s 1997 hit single and is included in its 2017 hits collection A Decade of Destruction), another of the band’s current singles, has received over 27 million streams domestically and is charting at #2 on iTunes Active Rock chart. It has also topped iTunes’ rock and metal charts worldwide. The song’s official and lyric video are streaming online now. Five Finger Death Punch launches its new live schedule in support of And Justice For None today in Tempe, Arizona. The schedule runs through September 9 in Cleveland, Ohio. Its dates are listed below. Tickets and VIP packages can be purchased here.